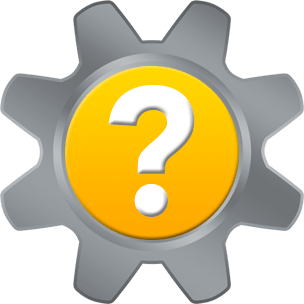 How to see which Flash Player version you have installed? Google bundles Flash Player (PPAPI) with its Chrome web browser. Google first enabled the integrated Flash Player by default when it released Chrome 5.0 in June 2010. Chrome automatically updates when Adobe releases a new version of Flash. This allows Chrome users to receive the abundance of Flash security updates upon their release. Its importance becomes more evident when Adobe assigns patched Flash vulnerabilities a Priority 1 severity rating. Priority 1 updates resolve “vulnerabilities being targeted, or which have a higher risk of being targeted, by exploit(s) in the wild…” So is there indeed no need to update Flash Player in Chrome since Flash updates automatically? It is possible that Chrome may appear to be up-to-date when the bundled Flash Player is not the latest version of Flash available. When you use Chrome to visit Adobe’s Flash verification page to check, you see Flash Player is pre-installed in Google Chrome and updates automatically! This message displays in Chrome even when the Flash version is not the latest available version. 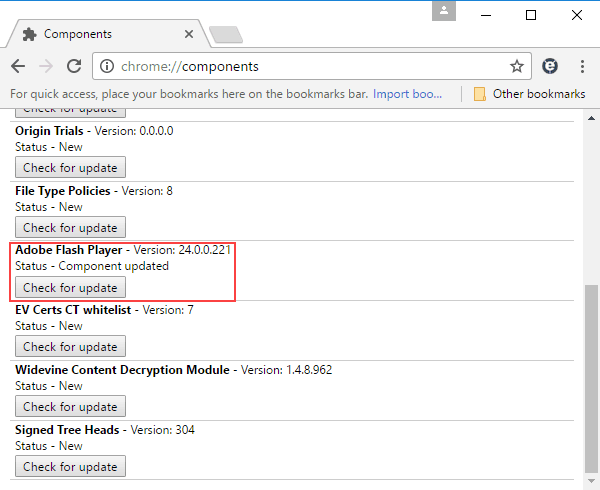 Security-conscious Chrome users can ensure their integrated Flash Player version is up-to-date by manually checking for updates. 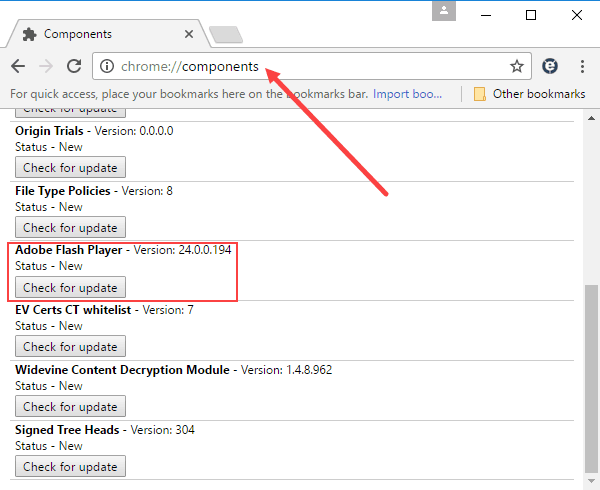 To manually update Flash Player in Chrome, visit chrome://components in the omnibox. Scroll down to Adobe Flash Player. Take note of Flash Player’s Version number in this February 15, 2017, screenshot. Chrome was up-to-date at version 56.0.2924.87. Adobe Flash Player 24.0.0.221 was the latest version. The installed version of Chrome is the latest too, yet the integrated Flash Player version is still the previous 24.0.0.194 version from Adobe’s January 10, 2017, update. 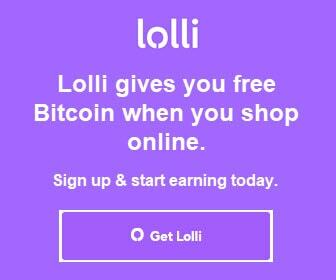 Next, click the Check for update button. The Status changed from New to Component updated. The Adobe Flash Player version number changed from 24.0.0.194 to 24.0.0.221. Now the integrated Flash Player version in Chrome is the latest version. Another option is to download the latest version of Flash Player for Chrome from Adobe’s website. Under Step 1, select your computer’s operating system. 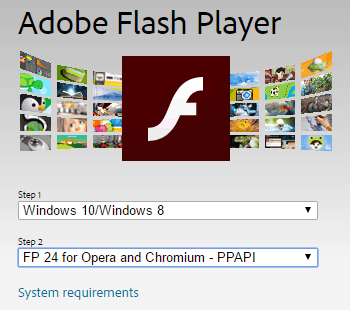 Under Step 2, select FP 24 for Opera and Chromium – PPAPI. Click the yellow Download now button, and follow the prompts. Note the Optional offers on Adobe’s download page. If you do not want to accept the optional offers when you download Flash Player, uncheck the pre-checked boxes. 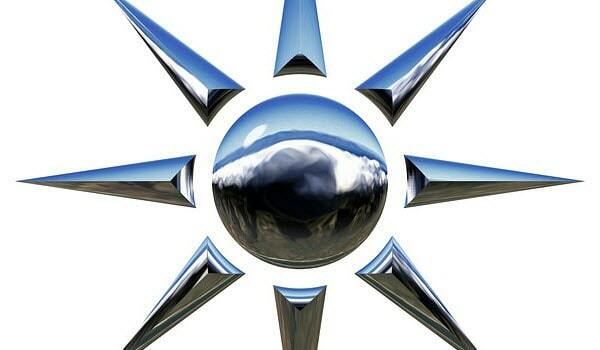 Thank you for visiting Tech Help Knowledgebase to learn how to update Flash Player in Chrome.